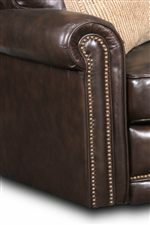 This reclining loveseat has a traditional style that is characterized by the rolled arm rests and nail head trim. Choose from several hundred color and cover options to fit in with existing decor or add new life to your home. Two 19 inch square accent pillows come standard with this piece. 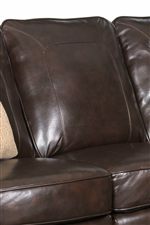 Use this loveseat in your elegantly styled living room for a comfortable and fashionable accent. 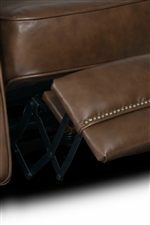 The Jasmine Traditional Manual Reclining Loveseat by Lane at AHFA in the area. Product availability may vary. Contact us for the most current availability on this product.